HIJACK > Food for your Ears > Hijackers' Tunes and Mixes > Depth Of Vision EP Vol.4 - Out Now on AutomAte! 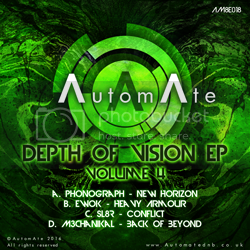 Depth Of Vision EP Vol.4 - Out Now on AutomAte! The Depth Of Vision EP series has thus far offered an incisive look through the AutomAte vaults at some of their exceptional breakthrough artists. This latest chapter aims to showcase two sides of a stylistic coin, placing old-school vibe-led pieces directly alongside punchy modern productions, demonstrating that it takes all sorts to feed a healthy scene. Phonograph opens the EP with New Horizon: a thoroughly modern, hard-hitting, swaggering masterclass in groove and grunt. The killer combination of funk and weight will win this track a place in many a record bag. Ewok may not have been seen in public since AM8E006 but has been working solidly with the AutomAte crew behind the scenes. Heavy Armour delivers a compatible vibe with his previous solo efforts for the label, rescued from deep in the techy, dark traditions of old school DnB. Sl8r’s offering Conflict is a more contemporary, head-nodding, foot-tapping groove. Equally at home on the headphones or in the dance, there is a spring in its step that belies its simplicity. Hungarian newcomer M3chanikal draws this chapter to a close with a light & energetic techy roller. Back Of Beyond offers plenty of pace and, rather than an ending, leaves the series feeling wide open for the next instalment.